Greeks typically have 3 meals a day. Traditionally the largest meal of the day was lunch, but many habits have changed due to Greeks adapting a westernized way of living. Not the most popular meal of the day, traditionally, Greeks ate a small and simple breakfast, such as herbal tea with bread or paximadi (dried bread). Coffee was more of a luxury item, but when it was available it was consumed alone or also with bread. Another simple breakfast consisted of soft-boiled eggs with bread. Farmers who needed a breakfast to sustain them consumed trahana, a type of grain/pasta made with milk. Today breakfast is much more westernized and Greeks may eat cereal with milk, bread with jam or honey, yogurt with honey. Many Greeks just have coffee and grab something on their way to work or school such as a cheese pie, spinach pie, the popular sesame bagel-style “koulouri” or even a croissant. Since most Greeks don’t really eat a huge breakfast they usually get hungry around 11 am, their preferred snack is again a savory pie such cheese pie “tyropita” or spinach pie “spanakopita”or a ham and cheese grilled sandwich. In the ’60s, ’70s and ’80s before the 9 to 5 workday came into force all Greek families ate their main meal of the day at home between 1.30pm and 2.30pm, when schools were out , shops closed and dad was home. Today however this type of meal will be consumed at work and only children will eat at home. Traditionally this meal consisted of a vegetable stew/casserole with cheese, bread, salad, and wine; for the more affluent, meat may have been on the menu. Farmers would consume anything they could carry with them, which was basically bread or paximadi with cheese, olives or tomatoes, or fruit. Today Greeks still may eat a traditional vegetable casserole for lunch, but in most cases pasta grilled meat, and sandwiches are also on the menu. In the old days, Greeks could take a nice nap after the mesimeriano and when they woke up which was around 5 in the afternoon they would drink a Greek coffee with a spoon sweet or some other small dessert or cookie as an accompaniment. Today, not many people have the time to take a nap, but the coffee habit still remains. Greeks eat late. If you go to a restaurant before 9 pm, most likely it will be empty. 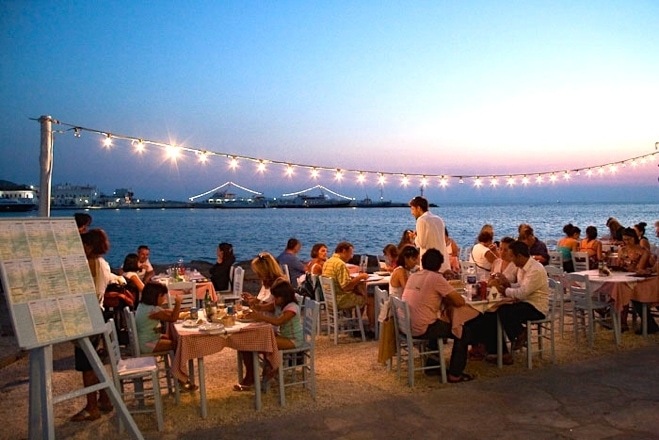 Most Greeks will eat dinner around 9 to 10 pm. If they have had a substantial lunch then they will eat something lighter for dinner such as fruit with yogurt, a sandwich, salad or a small amount of leftovers from lunch. If they haven’t really eaten a good meal for lunch they may have a full meal or order pizza, souvlaki, hamburgers or even Chinese. Younger generations usually eat their main meal at this time. It’s also the time Greeks go out with friends. Special thanks to my journalist/foodie sister Maria for her contribution. Ya I think it was a great thing to help me with! Informative. It set me to wondering how the timing of the meals and what the traditional people ate fits into the nutritional cycle of healthy people. Assuming one is eating the correct foods and amounts, does the time of day they are consumed have any special benefits nutritionally or behavorially? I found it interesting to learn that the 9 > 5 working day only came to Greece after the ’80’s. Greece has always held a special interest for me from the early 70’s onwards. Crete was the longest living population in the world up until 1968 (I think) when the Okinawans replaced them, now we have Ikaria (sometimes spelt Icaria) amongst the longest living people on the planet I remember a photo in World Book Encyclopaedia showing a fire pit with whole sheep on long poles being roasted, this was supposed to be a traditional cooking method for villagers for group gatherings. Prior to seeing this I thought Greek people mainly farmed goats because of the rocky terrain, hence feta cheese from goats, I know you can make it from sheep or goat milk but I had only seen goat. The information I have seen would indicate that there was a very low consumption of red meat in Greece. I remember that World Book article picture too! As I recall, there were several lambs on poles in a row and I think the event was Easter Sunday. The Greeks don’t eat red meat often, you are right, but when they do, they do it right! The difference between Western societies and Greece in regards to eating habits was noticeable to me when I travelled to Greece. Simple breakfasts in Greece (as opposed to cooked breakfasts in Western societies) leave you feeling light and energetic instead of over-full and lethargic. Greeks also spend a lot longer eating their dinner as well. Greeks always eat dinner in the company of friends and/or family over the dinner table. Wonderful information! I was just wondering if you could provide me with a date (the year it was published) for this page so I can correctly reference it. Hi Charlotte, That is a permanent post on the site. You usually note the date accessed when referencing a website. Thanks for this. My heritage is Greek and internet searching enough I can never ever figure out how to make my own household into a greek or mainly greek household for foodstuffs. I’m 34, just finished 8 years in the army so in my new apartment as I’m going to college I want to convert directly to a Greek household and better appreciate my heritage. 9pm dinner. I could do that but not mt kids. No way. Bedtime is 730/8pm lol. I would lose my mind! What time do they wake/start their day? I am currently doing a research task on Greek cuisine for my GCSE and this was SO helpful honestly I have no idea what i would have done if i hadn’t found this website!! THANK YOU!!! Excellent source of information for my Greek project. I am Greek but it is explained well thoroughly and better than I could have. Well done! Hello, Elena. It’s funny but my family eats kind of on this timetable too, and it has felt natural to me since having kids. And know I know why! I am of Greek Cypriot ancestry on my mother’s side – Papou was from Cyprus but moved to the USA when he was young and married a woman of Pennsylvania Dutch extraction – so my mom wasn’t really raised with a Greek way of living and eating, though, and we ate pretty typical SAD 🙁 when I was growing up. I can’t help but believe this led to my parents both developing cancer. 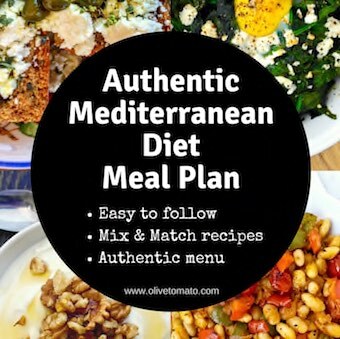 However, I love Mediterranean-style food and I want very much to avoid cancer and fix other health issues I have had since a child – which I believe are connected to diet and other lifestyle choices. I married a man from the Midwest who hates fish (I love fish 🙁 but he is very sensitive to the smell so the only time I eat it is either straight from the can or when we eat out). He has hypertension that we’re trying to treat. I think if we could find a way to get him to eat Mediterranean diet sans fish I think he’d do it. Any ideas? Thanks. Thanks for sharing you fascinating family story! Yes, Mediterranean diet is totally doable without fish. The most important aspects are plenty of vegetables, good fats and less meat.